Old World Vultures, Genus Gyps and others. 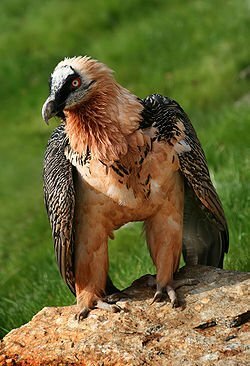 Old World vultures belong to the family Accipitridae, which also includes eagles, buzzards, kites, and hawks. Palm-nut Vulture, Egyptian Vulture and Lammergeier separate from the others. Both Old World and New World vultures are scavenging birds, feeding mostly from carcasses of dead animals. 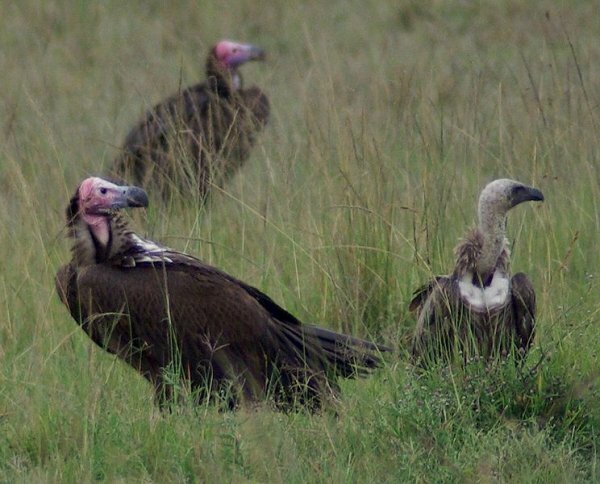 vultures ate flesh from carcasses, and thus would be difficult to keep clean. Lammegribben, Gypaetus barbatus, med et vingespenn på over 3 meter! Diclofenac poisoning has caused the vulture population in India and Pakistan to decline by up to 95% in the past decade, and two or three of the species of vulture in South Asia are nearing extinction. This has been caused by the practice of medicating working farm animals with diclofenac, which is a non-steroidal anti-inflammatory drug (NSAID) with anti-inflammatory and pain killing actions. Diclofenac administration keeps animals that are ill or in pain working on the land for longer, but, if the ill animals die, their carcasses contain diclofenac. Farmers leave the dead animals out in the open, relying on vultures to tidy up. Diclofenac present in carcass flesh is eaten by vultures, which are sensitive to diclofenac, and they suffer kidney failure, visceral gout, and death as a result of diclofenac poisoning. The decline in vultures has led to hygiene problems in India as carcasses of dead animals now tend to rot, or be eaten by rats or wild dogs, rather than be tidied up by vultures. Rabies among these other scavengers is a major health threat. India has one of the world's highest incidences of rabies. The decline in vultures causes particular problems for certain communities, such as the Parsi, who practice sky burials, where the human dead are put on the top of a Tower of Silence and are eaten by vultures, leaving only dry bones. Meloxicam (another NSAID) has been found to be harmless to vultures and should prove an acceptable alternative to diclofenac. The Government of India banned diclofenac, but over a year later, in 2007, it continued to be sold and is still a problem in other parts of the world.